This is a beautiful top by Ninth Moon made from the incredibly soft modal fabric.Available in black (size 16), purple (size 14) white (size 10) and red (size 16). This is a beautiful top by Ninth Moon made from the incredibly soft modal fabric.Available in black (size 16), purple (size 14) and red (size 16). This top retails at high end boutiques for $100.00. Please email me your size and colour. 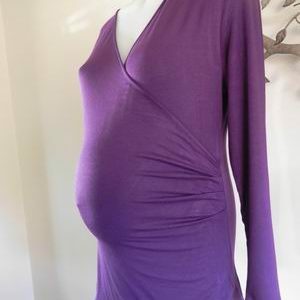 Be the first to review “NEW Purple Crossover Feeding and Maternity Top with Long Sleeves” Click here to cancel reply.